Cooking offers me life lessons on a weekly basis. 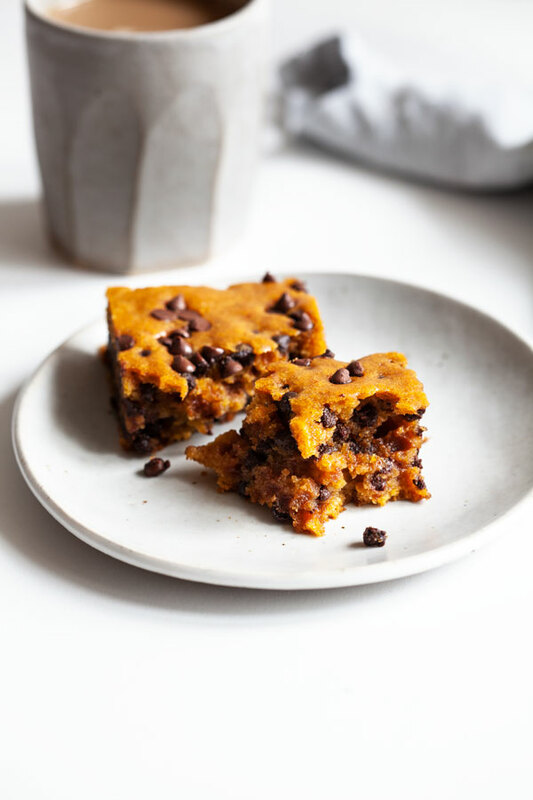 This week, the lesson—administered by these cakey vegan pumpkin chocolate chip blondies—was to accept things as they are. Acceptance—meeting life where it is, not constantly trying to fight against things, control them, or force them to be a certain way—is a theme I meditate on constantly, read about in books, learn again and again in yoga. Who knew that a “failed” baking venture would be such a good teacher? This blondies were, as the title sort of suggests, intended to be cake. I was thinking about a light, fluffy, chocolate studded snacking cake. 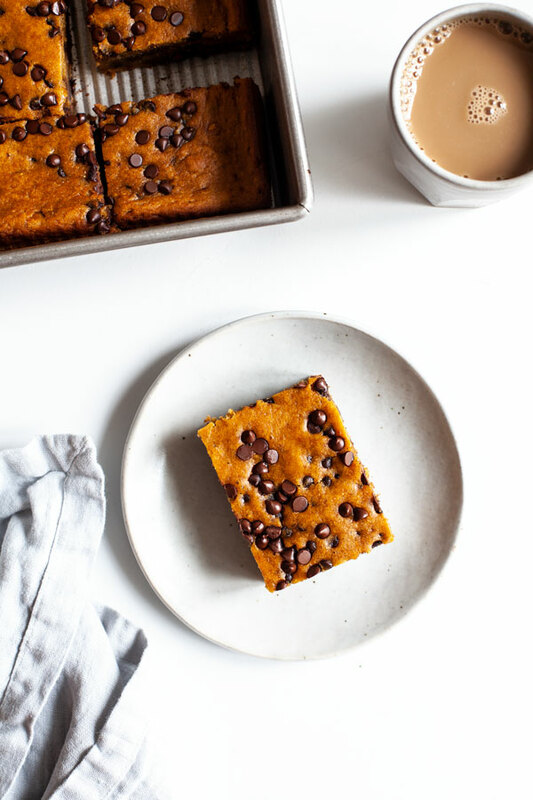 It’s just the kind of treat I love (cake is my all-time favorite dessert), and I love it even more at this time of year, when it’s getting cooler and my excitement to bake returns from its summer hiatus. The thing is, in spite of using the same flour/wet ingredient proportions that have served me well with countless other cakes (this one included), I couldn’t get this one to have that light, fluffy crumb I’d been thinking about. The interior kept coming out of the oven super moist and dense. I changed things around four times (yes, this baking project has been unfolding for weeks): different wet/dry ingredient ratios, new liquids and fats, different flours. Hilariously, some pretty substantive changes aside, it kept turning out the same way. The thing is, each time I tasted the blondies, they were good. Really good—as in, difficult to stop eating, and certainly tasty enough that I had no problem polishing off samples of my “failed” baking batches. So, I decided to post them. I do this full well knowing that a lot of people will think they taste like cake that’s too gooey; blondie lovers will probably think they’re too cake-like. I can’t imagine any expert bakers or dessert purists liking them. But honestly? I like them. They’re gently spiced and full of chocolate. They’re rich, but they don’t feel greasy. They’re vegan. They’re easy. This blog has always been a place where I share things I really enjoy. Sometimes that means sharing recipes that other folks won’t like, and while that makes me feel badly, I know it’s also part of writing about food. 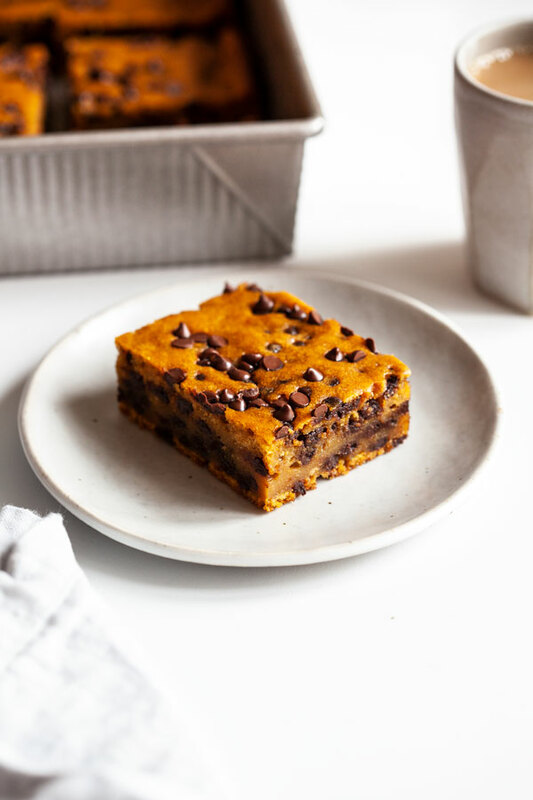 With the spirit of honesty in mind, here are my pumpkin chocolate chip cakey blondies, or blondie-like pumpkin chocolate chip cake, or whatever you’d like to call it. Here’s hoping that someone out there will try it and agree that, no matter how hard to classify, it’s pretty fun to eat. Preheat your oven to 350F and lightly oil a 9 x 9 square baking dish. Mix together the flours, baking powder and soda, salt, cinnamon, and ginger in a large mixing bowl. Mix together the oil, pumpkin, maple syrup, water, and vinegar in a separate bowl. Add wet ingredients to dry and mix until you have a mostly smooth batter. Fold in ¾ cup chocolate chips. 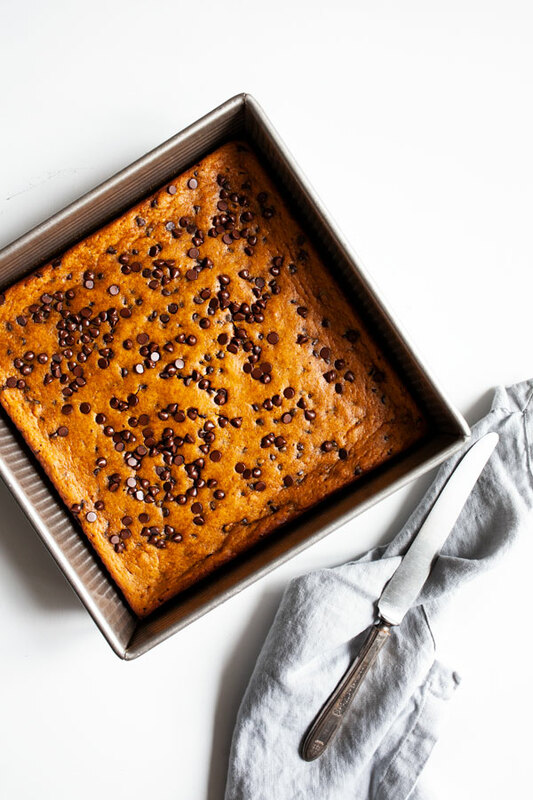 Pour the batter into the baking pan and top with the remaining chocolate chips. Bake for 35-40 minutes, or until the top is lightly golden. Allow the cakey blondies to cook for at least an hour. Cut and serve. One of my more persistent tendencies is to refuse to see the good in things, because they don’t meet whatever preconceived notion I had in my mind of what they’d be like. No matter how rich, how interesting, how right they feel, I dwell on the disjunction between expectation and reality. Wishing you all a great week, and a fabulous Halloween! This post is sponsored by So Delicious Dairy Free Frozen Mousse. All opinions are my own, and I love this light and creamy new treat. Thanks for your support! One of the first cooking routines to fall by the wayside when I’m busy is baking, which is a shame, because I love it so very much. It’s hard to justify the time spent baking bread or mixing the batter for a cake when I have a lot of necessary weekly batch cooking to take care of, but I inevitably perk up and feel better when I make these things. They’re reminders that making food doesn’t always need to be purposeful or functional. Sometimes it can be a source of pleasure, pure and simple. 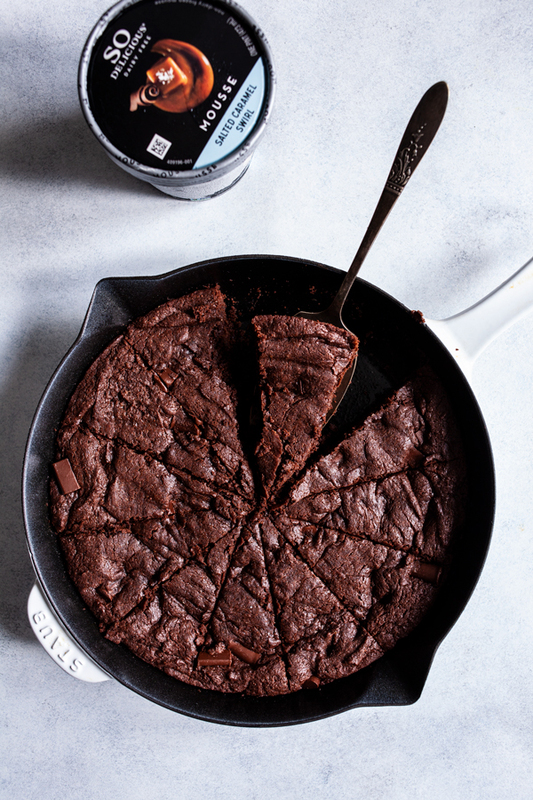 These fudgy, secret ingredient vegan skillet brownies à la mode are a pleasure indeed, and I’m so happy that I made them this week. In spite of the fact that there’s nothing particular practical about having them around, they’re delicious, and the relatively short ingredient list makes them appropriate for even these hectic times. 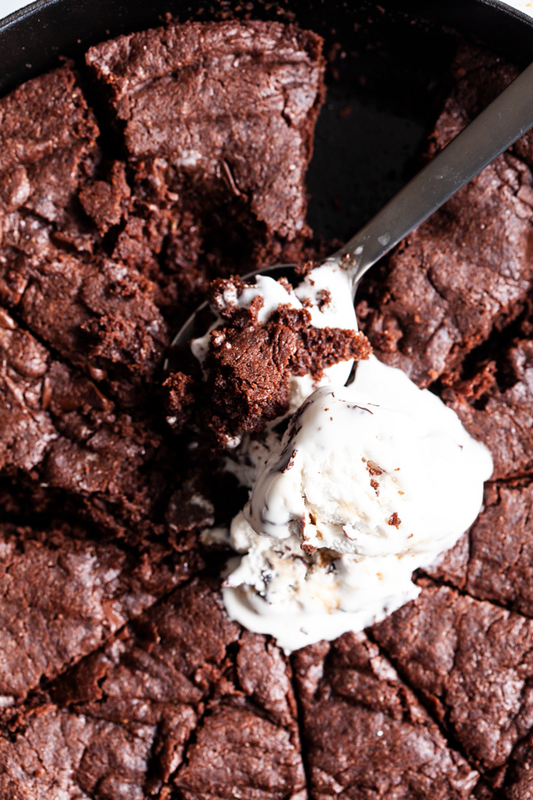 I really should call these double secret ingredient brownies, because there are two special components to speak of. 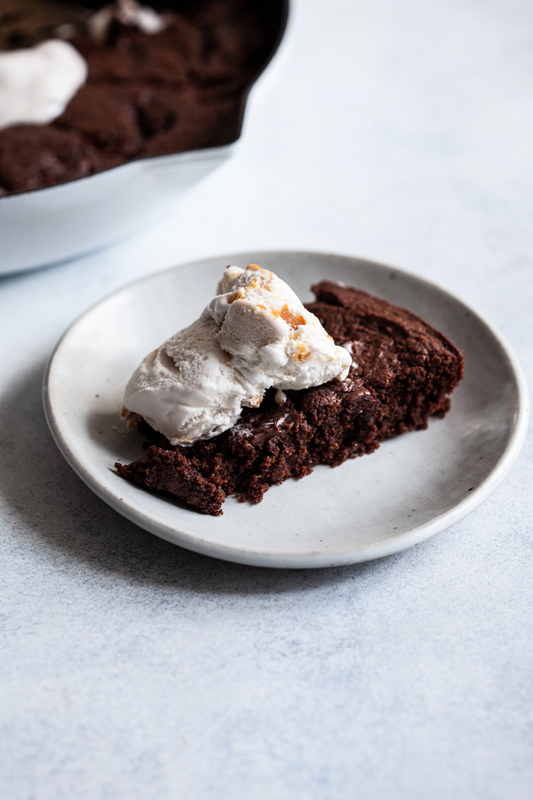 The first—the secret ingredient that gives the brownies richness and a wonderfully fudgy texture—is tahini. I’ve been seeing recipes for tahini chocolate chip cookies right and left, and I’ve wanted to see how tahini would work in a brownie for a while now (I’ve had success with almond butter in blondies, after all). 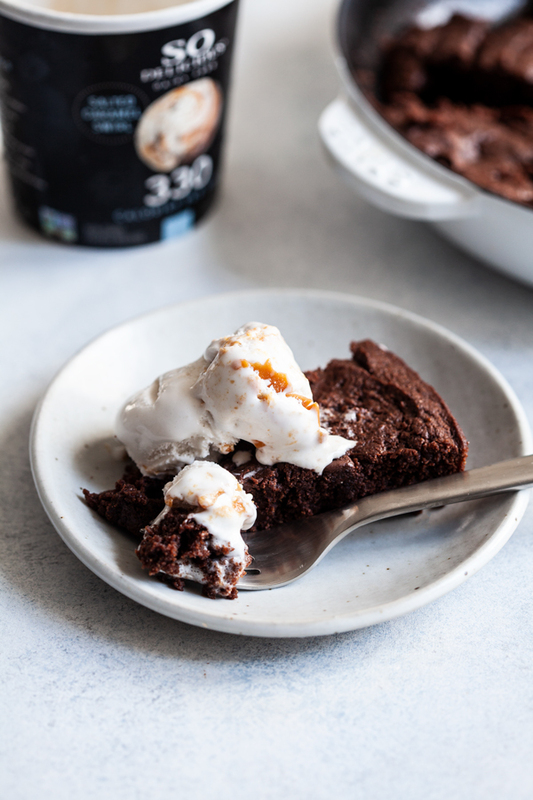 The only thing that could make the skillet brownies even more appealing is the addition of a really great frozen topping—because skillet brownies are so much better when they’re served hot and gooey and covered in something cool and sweet. That’s where special ingredient #2 comes in: the new So Delicious Dairy Free Frozen Mousse. I’ve been hearing about this light, frozen dessert for a while now, and I’m so happy to have had a chance to sample the flavors. They range from lemon and mango swirl to chocolate chip, salted caramel, and peanut butter swirl. Not surprisingly, these last three were my favorites, but the fruity flavors are refreshing and tasty, too. 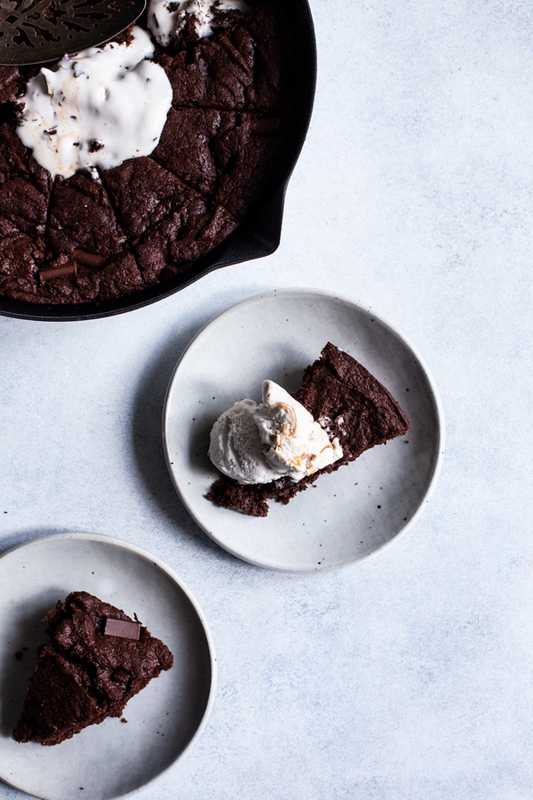 The salted caramel swirl was the winner for me—I love a touch of salt in any dessert—and I chose to pair it with the skillet brownies for a perfect hot/cold texture contrast. How to describe the frozen mousse? It’s someplace in between ice cream and frozen yogurt, but not really either of those things. It feels whipped and light, which makes it lovely for pairing with an otherwise rich, decadent, fudgy dessert. 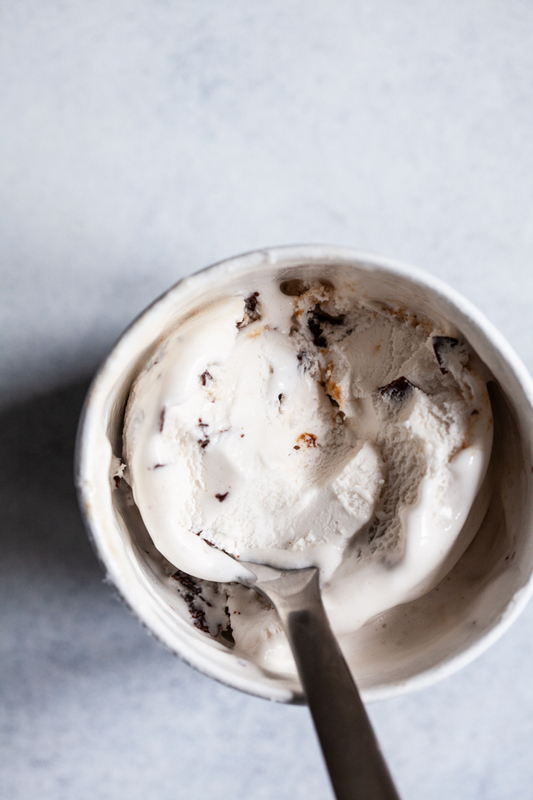 It’s always my instinct to serve ice cream with cake or other treats, but it can all get a little cloying if the ice cream is itself super rich. These frozen mousses really aren’t—they add the frozen creaminess that so many desserts call for without overwhelming the dessert itself. And because they’re not overly rich, I think they’d make a super refreshing, summery (or wintery?) afternoon treat, too. What else to say about this dessert? When you first, mix the dough, it’ll seem very dense and stiff. Don’t panic. It’ll bake out nicely; you just have to spread it evenly in the skillet. 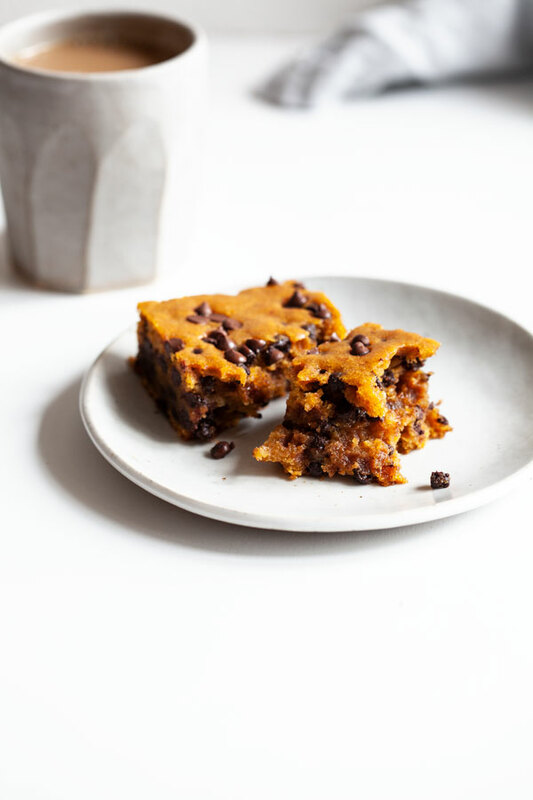 Once baked, the brownies are more tender than some others I’ve made (like these espresso brownies, which keep their shape more readily), but the fact that you can practically eat them with a spoon feels sort of appropriate for a skillet dessert. 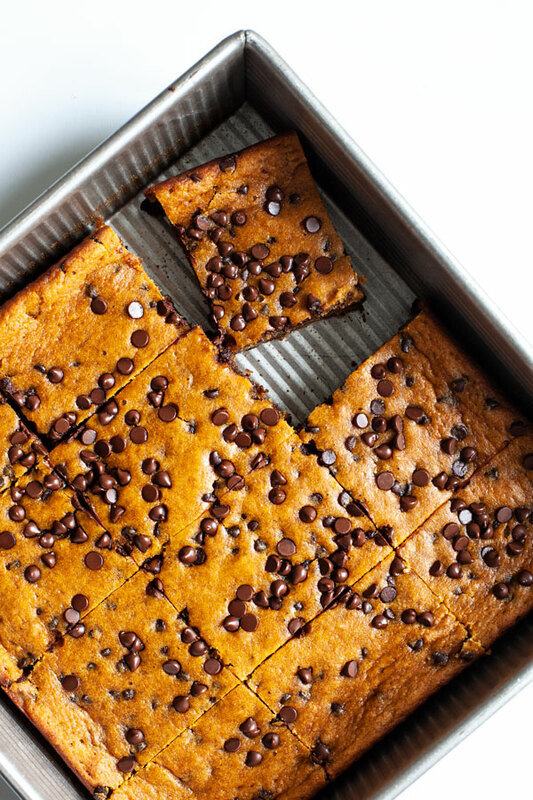 I cut them into wedges and ate mine warm, but it would be very fun to serve these for a crowd and have everyone just dig—no slicing required. Here’s the recipe. Preheat your oven to 350F and oil a 10-inch, well-seasoned cast iron skillet (a nonstick skillet will also work well!). Mix together the flour, coconut sugar, cocoa powder, baking soda, and sea salt in a mixing bowl. Separately, whisk together the tahini, yogurt, and vanilla. Melt 5 ounces of the chocolate chunks or morselsin the microwave or over a double boiler. Add the tahini/yogurt/vanilla mix to the melted chocolate and combine well. Add this mixture to the dry ingredients. The batter will be very thick. Fold in the remaining 3 ounces chocolate chunks or morsels. 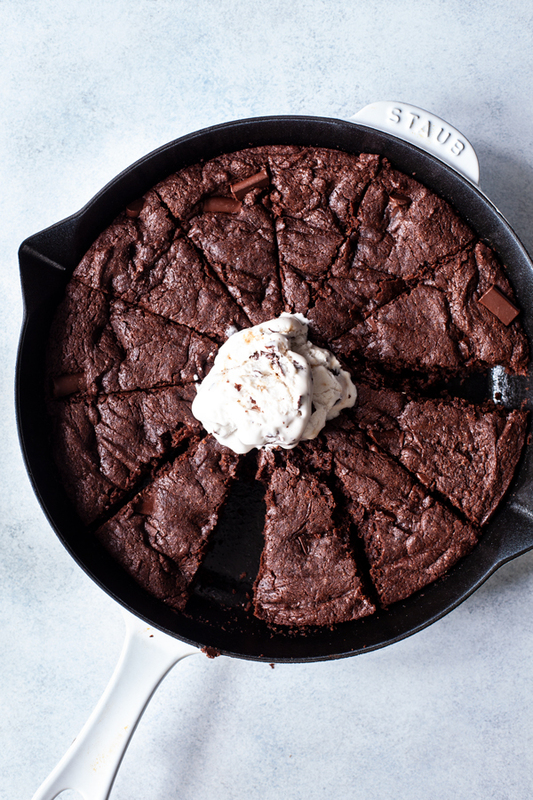 Spread the batter into your skillet. Bake for 22 minutes, or until the top is set and the edges firm. 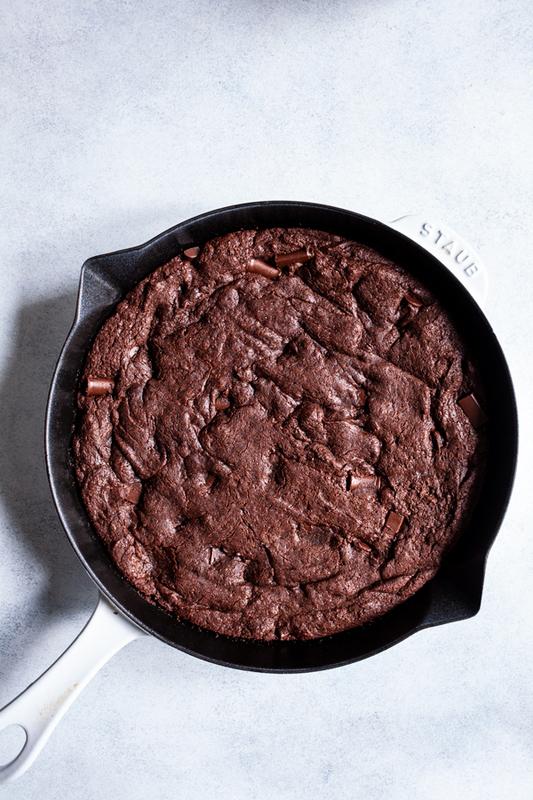 Remove the skillet brownie from the oven and allow it to cool for at least 30 minutes before serving with the frozen mousse. I certainly won’t mind having slices of this delicious, chocolatey treat to pack up in my everyday lunches. It may even be worth storing some frozen mousse in the work freezer! I’m excited to keep exploring these frozen mousses—with and without another treat to keep them company. Yet another fun new product that makes me grateful to be vegan right here and now. Wishing you all a lovely start to this new work week. I’ll be back on Thursday with a delicious, versatile new dip from my friend Brandi‘s awesome new cookbook! Stay tuned.